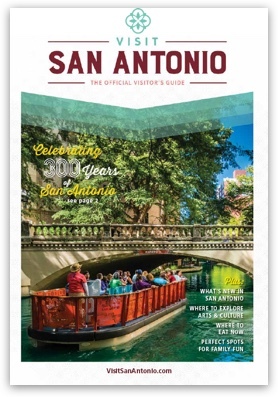 San Antonio blooms with fresh things to do, places to see, and new spots to eat and drink during the spring season. Explore along the Mission Reach to experience Texas’ only World Heritage Site, the Spanish colonial missions. Let the thrills of theme parks take your next adventure to new levels with seasonal rides at Six Flags Fiesta Texas, SeaWorld San Antonio, Morgan’s Wonderland and more. Visit rotating and regular exhibits at various museums. Or, pack a picnic and take in the blooming beauty of our great outdoors. San Antonio is the perfect spot for spring break with the family or a romantic getaway! When it comes to family fun, Six Flags Fiesta Texas has plenty of thrills. Home of the Wonder Woman Golden Lasso Coaster—the world’s first single-rail coaster, exhilarating rides, live entertainment, and more. Every object has a story of how it is made. Join us this spring for our new exhibit, How People Make Things, and celebrate that story—the people, the manufacturing processes, and the technology used to make everyday objects in our world. Book your spring season travel early & save 10%! Discover the culture, art, music and tastes of city that make it the best spring experience. While here, take advantage of the Marriott Portfolio of brands across the city, on the River Walk and in the Hill Country that will make your trip one to remember. Celebrate the spring season with fresh, exciting events like Valero Texas Open, San Antonio Book Festival, Seven Seas Food Festival at SeaWorld San Antonio, Fiesta! San Antonio and more. Explore exhibits like Planet Pioneers at The Witte Museum, How People Make Things at The DoSeum and more. Check out our event calendar for regular updates and event details. Experience the thrill of a lifetime at world-class theme parks in the Alamo City. Take on a Texas-sized adventure and fun for the whole family at SeaWorld & Aquatica San Antonio and Six Flags Fiesta Texas. Enjoy the only ultra-accessible park in the world at Morgan’s Wonderland and their newest water experience, Inspiration Island. Or, make waves at several area waterparks – think Splashtown, Schlitterbahn and more. Get wild at the San Antonio Zoo, home to more than 750 different species. Then, take a quick drive to the Natural Bridge Caverns, a vast limestone cavern carved over millions of years. And be sure to visit nearby Natural Bridge Wildlife Ranch, which boasts 40 species of native, exotic and endangered wildlife. San Antonio is filled with family fun attractions! Explore The DoSeum, San Antonio’s museum for kids – dreamers, builders, thinkers and doers. Catch a live show at the Magik Theatre, in the heart of Hemisfair Park, for interactive, theatrical productions for family members of all ages. Don’t miss The Witte Museum on the Broadway Corridor, where nature, science and culture meet. Plan your perfect spring getaway with special offers on everything from accommodations, attraction tickets, food and drink vouchers, and more.